On September 23, 2010, L'Oreal USA and Discover magazine convened a panel for a Congressional briefing on Women in Science. The panel: For Women in Science: 21st Century Policy & Politics covered issues faced by women in science and explored public policies that might address the challenges facing the advancement of female scientists. Dr. Sara Seager, Professor of Planetary Science, Massachusetts Institute of Technology. And perhaps not surprisingly, results of a recent survey of 1,300 female and male scientists suggest that female scientists might be making significant personal sacrifices to achieve professional goals. The survey, commissioned by L'Oreal, in partnership with the American Association for the Advancement of Science (AAAS), revealed that 61 percent of female respondents were struggling to balance their personal lives and their careers in science, technology, engineering, and math (the so-called "STEM" fields). Speaking from a personal experience that took place just this week, I had been part of a proposed panel for the upcoming AAAS meeting in DC and had contributed to the writing of the proposal, only to be told by the organizer of the panel (a male) this week in an email message that, for some unclear reason, I was now "cut" from the panel. Maybe it is my plumbing. No problem, I am back to work on an invited paper and since the "let-down" above have gotten several invitations to speak in other countries (I go to Washington DC often enough). The 2010 MacArthur Fellows were announced today. They are a distinguished and varied group. This year there are 23 MacArthur Fellows, and each is the recipient of $500,000 to be given in equal annual increments of $100,00 over 5 years. The official announcement from the John D. and Catherine T. MacArthur Foundation is here. These awards are with no strings attached! On the list is Annette Gordon-Reid, who is well-known to Fellows of the Radcliffe Institute for Advanced Study at Harvard. The list also includes a computer security expert and researcher, a high school physics teacher, a biophysicist, an indigenous language preservationist, an economist, a fiction writer, an anthropologist, a theater director, a fiction writer, an entomologist, among others! Two new Fellows are from the smallest state in the union -- Rhode Island! Sorry, I may have a bias since I have 4 degrees from Brown University in Providence and worked for several years in Newport, Rhode Island. Four new Fellows are from Massachusetts (3 of these from Cambridge)! Interesting that over 25% of the 2010 Fellows are from the states of Rhode Island and Massachusetts but, of course, those of us who live and work in New England know the creative atmosphere here (the distinct four seasons add to the stimulation and to our fortitude). And speaking of Radcliffe Fellows, who were also MacArthur Fellows, see my earlier blogpost on Anna Schuleit and her public art installation, "Just a Rumor," at UMass Amherst (I hope that you recognize that face in the water since he certainly was a bona-fide genius)! UMass Amherst has a former MacArthur Fellow, Professor Nancy Folbre on its faculty; she writes a weekly column on The New York Times Economix blog. Congrats to a New College President -- Dr. Lynn Pasquerella! Yesterday was a celebratory day as Dr. Lynn Pasquerella became the 18th President of the oldest women's college in the US, Mount Holyoke College, which is part of the five college system, which also includes UMass Amherst (where I teach), Amherst College, Smith College, and Hampshire College, in beautiful western Massachusetts. There was a lot of pomp and circumstance surrounding her induction in South Hadley with students, staff, alums, dignitaries, and presidents and officials from other colleges and universities in attendance on a rather warm day. Dr. Pasquerella was the first female in her family to graduate from college and her life story shows, how, despite significant odds (her parents divorced when she was 11 and her mother moved the family to South Hadley to work in a factory), through education, determination, and a winning personality, she has achieved so much. Dr. Pasquerella transferred to Mount Holyoke as an undergrad after receiving a degree from Quinebaug Community College in Connecticut. She then went on to receive her PhD in philosophy from Brown University (my alma mater as well), taught and administered at the University of Rhode Island, before becoming the Provost at the University of Hartford, where my husband teaches. She has traveled far and wide in support of females globally and has spent significant amounts of time in Kenya over the past couple of years, during which she led groups of faculty and students from several universities and colleges. This article in The Daily Hampshire Gazette has nice quotes from President Harrison of the University of Hartford, who, like Pasquerella, is a lover of the sport of baseball, and who was in attendance at her inauguration. She has terrific energy and ideas and the festivities yesterday were called a love-fest, complete with fireworks. We wish Dr. Pasquerella all the best in her new role as President of Mount Holyoke College. This week has certainly flown by quickly! 11. starting my reviews of proposals for a scientific foundation of another country (luckily, this country pays for this kind of hard work). All of the above I somehow managed to do as our community was having a very hard time dealing with the sudden death of a terrific colleague. And the above does not even mention any duties/activities as a wife and mother! I am reeling from the shock this morning that George N. Parks, our magnificent and legendary leader of the UMass Amherst Minuteman Marching Band, has died unexpectedly at the age of 57. More on this breaking news story here. The band had just given a performance in Ohio and we were all anticipating tomorrow's huge football game at the University of Michigan where the band was to perform and Mr. Parks was to conduct. Seeing him with the band at practices on campus and at numerous football games at half time and even in parades on national TV was always special. One of the high points every year was when numerous high school bands in their colorful uniforms came to UMass Amherst to perform at half time for a football game. So many from the community and beyond came to watch this magnificent spectacle. This is a huge and unexpected loss and he never stopped leading the band. He will be missed terribly by all those band members who learned so much from him over his decades at UMass as well as by the audiences who had the thrill of seeing him conduct one of the very best marching bands ever. The band will play in his honor tomorrow at the UMass vs. University of Michigan game in Ann Arbor. For an eloquent and very touching tribute about what Mr. Parks meant to a former band member, and UMass Amherst graduate, Katie McLeod, who now writes for The Boston Globe, read here. As Ms. McLeod writes: Today I face challenges every day as an adult in the working world, but Mr. Parks's voice rings in my mind always. "It's not getting to the top that's the real challenge. It's staying there," he would say. It's about working as hard as you can no matter what your job, your title, or your circumstances -- even if you're the best already, or feeling the worst. Never stop learning, growing, achieving. It's up to us to do our best. I had a very enjoyable interview with a journalist late last week on my latest research which is on the negation of the Braess paradox as traffic increases. The article with interview is now online on physorg.com and appears as the top story today. What is more fascinating than traffic, whether that of vehicles on congested urban roads, to data on the Internet, and even electric power flows?! My paper on the topic was recently published in the journal Europhysics Letters and it cites the translation of the classical Braess (1968) paper from German to English that I did with Braess and my former doctoral student, Tina Wakolbinger, and that was published in Transportation Science in 2005. The beginning of the new school year is filled with new faculty and faces, receptions and introductions, and even elections (and, sometimes, appointments to new positions, including administrative ones). Last Friday, we had our Fall 2010 reception in the atrium of the Isenberg School of Management, which had a terrific attendance. At this event, new faculty and staff were announced, and some administrative changes noted plus thank you's given by the administration to those who have put out an extra effort for the school. One of the highlights for me, every year, at this special occasion, is the introduction of our new doctoral students. This year we have a class of 20 new doctoral students that come to us from various parts of the US, from China, Egypt, Turkey, and even Bulgaria! As the PhD Coordinator for the doctoral students in the Management Science track (some of the other tracks are: Finance, Accounting, Marketing, Organizational Studies, and even Sports Management) it is very exciting to see the new group of doctoral students who will be working closely with the faculty on research and, ultimately, teaching 2 or so courses at our school, before they received their PhDs. And as Faculty Advisor to the UMass Amherst INFORMS (Institute for Operations Research and the Management Sciences) Student Chapter I am delighted that the students already held an election and elected their 2010-2011 chapter officers! Plus, we have thousands of new undergraduate students (4,500 freshmen, to start, at UMass Amherst) that have arrived. With neighboring colleges such as Amherst College, Hampshire College, Smith, and Mount Holyoke also beginning the new academic year, this area of western Massachusetts is teaming with energy (and more traffic, I might add). Last Friday night, with the reception at the Isenberg School and the one honoring Anna Schuleit and her "Just a Rumor" painting on the side of the Fine Arts Center, there was no need to cook dinner. I had the distinct pleasure today of attending a reception in honor of the artist, Anna Schuleit, and her "Just A Rumor," a dramatic painting, which was painted upside down on a wall of the Fine Arts Center at UMass Amherst, with a reflection in the campus pond. Anna Schuleit was featured today in the Wall Street Journal, and since she was a Fellow at the Radcliffe Institute for Advanced Study at Harvard University the year after I was one, this was an event that I did not want to miss. Plus, it is so intriguing to try and figure out whose face she painted upside down! Can you guess? The above photos were taken at the event, and include several of Anna Schuleit, of her painting, the reflections in the pond, and of some of the guests. What I most appreciated, besides this dramatic public painting, and its changing reflection, was when Schuleit spoke about why paintings are so important and how they help us to stop and to slow down in this era of decreasing attention spans and moving images on computer screens. The late afternoon was cloudy and there was a slight wind, which created waves in the pond, so the reflection of the painting, which was completed by Schuleit only an hour before, moved soothingly with the waves. Schuleit, whose work has garnered her, besides a Radcliffe Fellowship, a MacArthur genius grant of $500,000, will be in residence at UMass Amherst this term. She joked that she might want to study nursing during this period. It was special that our Provost, Dr. James Staros, showed up to this event, as well as my Dean at the Isenberg School, Dr. Mark Fuller, and even our wonderful state representative, Ellen Story. Getting the news out about important and interesting research is essential to the dissemination of knowledge, to the furthering of discoveries, as well as to the education of the public and policy-makers. Typically, a researcher, upon completion of a study, which results in a paper, may first circulate the paper (now often done via email or via postings on various websites such as ssrn and arxiv) to obtain feedback, will give seminars on the paper, and will speak about the results at conferences. In academia, one still needs to publish the results in a peer-reviewed journal. Lately, though, there has been a lot of discussion in the blogosphere about whether one should just have the wisdom of crowds be used for reviewing rather than anonymous journal reviewers. Interestingly, the blogosphere discussions about various"proofs" were, subsequently, covered by the news media. You can read in Science News the latest on this issue (regarding P doesn't equal NP), which has quotes from my colleague in Computer Science at UMass Amherst, Dr. Neil Immerman. Once a paper passes the reviewing process (which can be time-consuming in the case of certain journals) and is published, how does one get the news out further? Some journals and professional societies send out press releases about their publications that they identify as meriting and having a greater audience appeal (Science, Nature, PNAS, are prime examples of such journals). Some schools, colleges, and universities are also outstanding at disseminating news about their faculty's and students' research findings and publications. (You can probably easily name some of these institutions who have the advantage of effective news offices, PR machines, and great media contact networks.) The same holds for such organizations as NBER who broadcast their studies (which may not be in peer-reviewed journals yet) and also have excellent media connections. What if a researcher does not have many/any of the above "advantages?" Yesterday, Dr. Sheldon Jacobson of UIUC brought to my attention a followup on the seminar, An Analysis of Pediatric Vaccine Stockpiling and Pricing Issues, that he gave in our UMass Amherst Speaker Series in Operations Research / Management Science last Spring, which was sponsored, in part, by the INFORMS Speakers Bureau, and which we greatly enjoyed and appreciated. My blog post on his visit to the Isenberg School (with photos) can be accessed here. NSF, which funded his research on the stockpiling of children's vaccines, issued a press release on his co-authored paper on the subject, which was published online in the journal, JIMO, November 2010. The NSF press release is very well-written and can be read here. Clearly, funding agencies (especially those supported by tax dollars) have a vested interest and, I should say, duty, in getting the news out about the research that they fund and it is important that they do so. This provides a researcher, who has funding, another option. In conclusion, enjoy doing your research, and I hope that, once it is published, it gets the dissemination that it deserves. Then again, in the final roundup and tally, it is the citations to your work that matter, the new ideas that it generates, and how it is ultimately used and applied, from those in your own discipline and beyond. Professor Greg Mankiw, a well-known economics professor at Harvard, who is sending off his oldest child to college, wrote a thoughtful article on the courses that he would recommend for a college student to take. The subjects that he recommends that students take in order to gain knowledge on how to play "the Game of Life" include: economics (clearly, since that is his area), probability and statistics, finance, and psychology. Frankly, such courses are among the required courses in a business administration undergraduate degree (with organizational behavior (OB) typically being the psychology-type of course in a business school)! However, to his list, I would definitely add at least one and, preferably, two or more courses in operations research / management science. In such courses students will learn how to optimize the utilization of scarce resources under constraints and how to make sense of the volumes of data that both individuals as well as organizations from companies to hospitals to educational institutions to even governments are faced with on a daily basis! One should care not only about the analysis of data but also about the optimization of business (and other) processes in order to gain competitive advantages. Plus, the greater one's portfolio of skill sets, the greater the employment opportunities. Luckily, in many business schools, including my own, the Isenberg School at UMass Amherst, various business majors, such as Operations Management majors, are required to take a management science course. The media has had extensive coverage of transportation news and research, which is very gratifying (and which is getting me really psyched to teach my Transportation & Logistics class). News about Professor Arnie Barnett's study, "Cross-National Differences in Aviation Safety Records," which appears in the August issue of the INFORMS journal Transportation Science, has now gone viral with articles on it from The Washington Post to The Sydney Morning Herald, with the latter with the attention-grabbing headline of "Your Chances of Dying in a Plane Crash? It Depends Upon Where You Fly." As those of us who have had the privilege of interacting with Professor Barnett of MIT's Sloan School of Management know, Professor Barnett has a fear of flying. We hosted Professor Barnett in our Speaker Series several Falls ago and he was fantastic! Coincidentally, as a frequent flier, this summer, I was trolling the Internet for safety stats on several airlines since I had a heavy travel schedule for speaking engagements that took me to South America and Eastern Europe. My intuition told me to be careful in deciding which airlines (and which routes) to fly and now Barnett's paper confirms that caution should, indeed, be taken. Plus, who could have missed the news about the South Korean female, Ms. Cha, a 69-year-old widow with four children, who on her 950th attempt passed her written driver's test and then on her 10th attempt received her driver's license! She has been lauded as a national hero for her determination and for never giving up. She actually said that she enjoyed taking busses to her driver's ed classes since she had only a minimal elementary school education and minimal literacy and craved learning! Her goal was to be able to get a license so that she could take her grandchildren to the zoo. As for another transportation news story, Michael Grynbaum, writing in The New York Times, has further coverage on the closure of Broadway in NYC, as well as on the history of the design on the street grid dating back to the early 1800s! My most recent paper, just published in Europhysics Letters, was on the related topic of network topology, traffic, the Braess paradox, and the wisdom of crowds. Is there a phenomenon of wisdom of crowds in transportation networks? In the paper, "The Negation of the Braess Paradox as Demand Increases: The Wisdom of Crowds in Transportation Networks," just published in Europhysics Letters, volume 91, (2010), I establish that this is, indeed, the case. Drivers act selfishly and independently in choosing their optimal routes of travel with no concern as to the effects of their choices on the effects of others or on congestion, which is known, in economics, as a negative externality. Such selfish behavior can lead to the infamous and counterintuitive phenomenon known as the Braess paradox in which the addition of a new road can actually increase the travel time for all! Hence, the removal of a road to traffic as has been done recently in Seoul, Korea and in NYC may actually improve the travel time. Our research proves that even in networks in which the Braess paradox occurs that, at higher levels of demand, e.g., with more drivers on a transportation network, the new route will no longer be used, and, hence, the Braess paradox will be negated. This novel result suggests that there is a wisdom of crowds phenomenon taking place. Since other networks, including the Internet and electric power generation and distribution networks, have features similar to that of congested urban transportation networks, this paper has important applications to the design of such networks, as well. Notably, it demonstrates that designers of critical infrastructure must capture the demands and the behavior of the users of the infrastructure in their designs since inappropriate designs may not only result in worse-off situations for all but, ultimately, in a lack of use of parts of the new infrastructure. Fascinatingly, it may also have applications to targeted cancer therapy. Information on the 2011 International Conference on Social Computing, Behavioral-Cultural Modeling, & Prediction is now available on the conference website! The conference will take place March 29-31, 2011 at the University of Maryland College Park, with tutorials on March 28. I enjoyed last year's conference so much at which Dr. Patrick Qiang and I presented a tutorial on Fragile Networks: Identifying Vulnerabilities and Synergies in an Uncertain World that I agreed to be the tutorial chair at this year's conference. This conference is truly interdisciplinary and the researchers and practitioners that we met last year were fascinating to interact with. The full call for papers can also be downloaded here in pdf format and the deadline for paper submissions is November 6, 2010. For the 2011 SBP Conference Committee click here. As the new academic year begins and students move into their new dorms (and new roles) on campus, many colleges and universities are hosting special events. 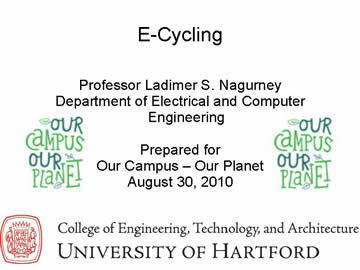 My husband has already started teaching at his university, the University of Hartford, and this past week it hosted a special series of events focusing on Our Campus -- Our Planet. At this full day of special activities, he gave a presentation on e-cycling, which he had worked on a lot and I thought it both relevant and entertaining so we have made his presentation available in pdf format. In his presentation, he references a paper that appeared in Transportation Research E that I co-authored with my former doctoral student, Fuminori Toyasaki, who is now a Professor at York University in Canada, and which is on the list of most-cited papers in this journal over the past 5 years. Who can forget one's freshman year and especially that monumental moment when one gets dropped off on campus and parents leave?! In terms of e-cycling (electronic recycling), the students of today certainly have much more electronic equipment that they bring to campus than their parents did. Nice that colleges are keeping the students busy with various activities and interesting lectures before classes begin.